The Village of Cinderberry, located in Georgetown, is an intimate community that includes 170 homes and a comfortable clubhouse. This cozy community welcomes active adults aged 50 or better with low-maintenance living in a picturesque suburban setting. The community also offers convenient access to major roadways and the Delaware coast. The clubhouse at The Village of Cinderberry includes an indoor swimming pool, a game room, library, and multi-purpose room for community events and activities. Though the community does not have an activities director, residents plan many exciting events and activities. A multi-purpose room can be used for a variety of community get-togethers, events or parties. There is even an indoor swimming pool and hot tub. Outside, the community offers both shuffleboard and horseshoe courts. The community also features sidewalks on one side of the street, street lamps, and lots of cul-de-sacs, making it a lovely place to walk in the day or evening. The 170 homes at The Village of Cinderberry will include both attached residences and detached single-family homes. Attached homes consist of duplexes (two attached homes), joined at the garage. The Village of Cinderberry includes two- and three-bedroom homes. There are single-level floor plans and some models which include a second-story loft. Each floor plan has many options, allowing for a variety of customizations. Every home in the community is designed with lots of closet and storage space, and deep garages allow for even more storage. The community was originally started by Circle J Developers, who built the first 140 homes. The project has now been acquired by LBG Homes, a builder known for quality craftsmanship and attention to detail, is expected to finish the remaining homes in The Village of Cinderberry. Standard features include designer kitchen and bath cabinets, marble bathroom countertops, Kenmore kitchen appliances, raised six-panel interior doors with lever handles, double-hung windows, screened patios, professional landscaping, and more. The Village of Cinderberry is a smaller, more intimate active adult community that welcomes residents aged 50 or better. Though the community does not have an activities director, residents come together with their own regularly scheduled events and activities. There are monthly potluck dinners, an annual community yard sale, and weekly games including poker, Mah Jongg, bunco, bingo, bridge and pinochle. There are also weekly yoga practices and water aerobics is held three times a week. Maintenance-free living is also encouraged at The Village of Cinderberry. All exterior maintenance, including grass cutting and landscaping, is included with ownership. Located on Route 113, the Village of Cinderberry is set just south of Market Street, which is the main street in Georgetown. 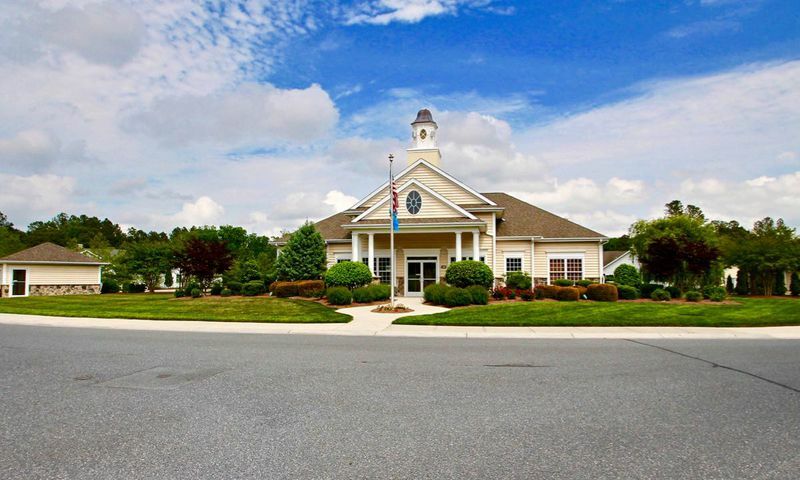 It offers convenient access to Route 9 and Route 18, and to Delaware's coastal resorts.The Village of Cinderberry is located near Delaware Technical and Community College, and the Possum Point Playhouse. There is also plenty of nearby shopping along Route 113. Only 30 minutes away residents can visit the Dover Shopping Mall to the north, or the town of Salisbury to the south. Salisbury includes its own shopping mall and a variety of additional shops. Cinderberry Hall - 6,500 Sq. Ft. There are plenty of activities available in The Village of Cinderberry. Here is a sample of some of the clubs, activities and classes offered here. The Piedmont models are no longer available in new construction, but homebuyers can find the Piedmont in a resale home. The Patriot models have two or three bedrooms with a one or two-car garage. The attached homes in The Village of Cinderberry are a great low-maintenance option. There are a few single-family homes found throughout the community. These handful of detached homes offer between 1,458 and 1,670 square feet of living space. Generally most single-family homes in The Village of Cinderberry have two bedrooms, two bathrooms, and an attached garage. Please Note: Floor plan information is not available at this time. 55places.com is not affiliated with the developer(s) or homeowners association of The Village of Cinderberry. The information you submit is distributed to a 55places.com Partner Agent, who is a licensed real estate agent. The information regarding The Village of Cinderberry has not been verified or approved by the developer or homeowners association. Please verify all information prior to purchasing. 55places.com is not responsible for any errors regarding the information displayed on this website.